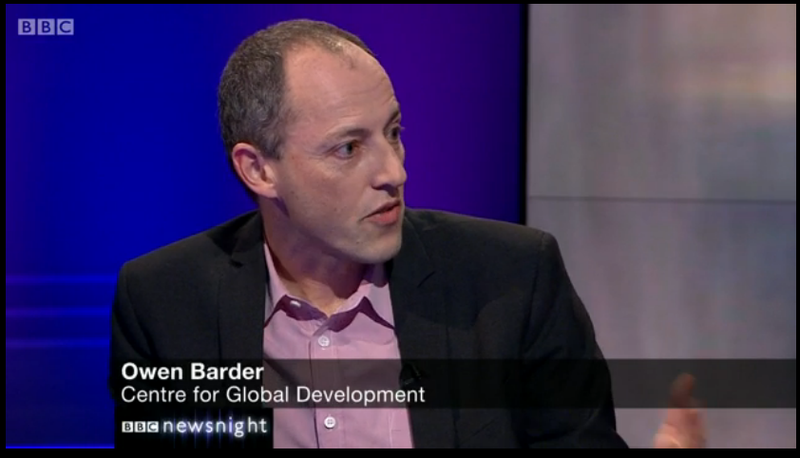 Owen Barder is Vice President, Director of CGD Europe and Senior Fellow at the Center for Global Development. He is also a Visiting Professor in Practice at the LSE and a Specialist Adviser to the UK House of Commons International Development Committee. His professional interests are the political economy of development policies and aid, transparency and accountability, innovative finance, public financial management, information, knowledge, technology, new media, Africa, health economics. From 2007-2011 Owen was based in Addis Ababa, Ethiopia. In this time he was the Director of aidinfo – a programme of Development Initiatives which aims to make information about aid more easily accessible. He was also a Visiting Fellow at the Center for Global Development. Before working on international development, Owen was the Prime Minister’s Economic Affairs Private Secretary, in 10 Downing Street. In this role, he coordinated Government policy and delivery on microeconomic policy, including trade and industry, the knowledge economy, environment, transport, regional policy, education, employment, science, and modernizing government. From 1988 to 1997, Owen was an official at H M Treasury. His roles included being Private Secretary to two successive Chancellors of the Exchequer, coordinating the public spending system, forecasting the world economy, forecasting and analysis of domestic labour markets, and medium term macroeconomic policy analysis. Owen took various breaks from the civil service to work in the South African Treasury, where he helped to develop a medium term budget process, the Center for Global Development where he helped to develop the Advance Market Commitment for vaccines, and as a Visiting Scholar at the University of California, Berkeley. In 1993, Owen set up the UK Government’s first website, for H M Treasury. From 2011 to 2015 he was an Associate at the Institute for Government. From 2009 to 2015, Owen was a member of the Advisory Board of Twaweza, which promotes opportunities for citizens in East Africa to hold government authorities to account. From 2000 to 2004, Owen was a non-executive director of OneWorld, a not-for-profit whose mission is to promote the use of the internet and media for the benefit of the world’s poor. Hi Owen, on a different note (than the internet issues), we may have to work together while/if I am sent to AA. I am with the French foreign service. I am currently in Pretoria working on domestic political issues. Best. Please take a look at the website and let me know if you think A4ID could be of assistance to you. I wish you all the best with your work. Good job and a great website (the running one)! It’s great of you to be doing work to better everyone’s lives as well. you’ve found a small enclave of followers and fans at my website http://www.therunningbug.co.uk – keep up the good work – and the running; we love your site and the valuable converters you have created. My company develops language learning software. I’m looking for people in Ethiopia who have an interest in video to make some simple videos in Amharic, which will be integrated in our product. Naturally, we’ll pay. If you, or someone you know, would be interested in this, please let me know. Are you still looking for someone to make videos in Amharic? If so, please contact me, I can help you with that. its nice work i want to say u is that just keep it up.am an elcetrical engineer workiing in ethioian telecomm corporation but i need your help in developing websites becouse am assigned to work in this area. I often write articles and published some on the weekly Fortune. I would like to work for or with you. Would love to learn more and see changes flourishing everywhere. Came across your blog while tweeting. Great to see your work across various disciplines, keep up the good job. Liked your website as well, clean and easy on the eyes. I was wondering if you have come across Microfinance. Would love to hear more about that. Happy to find your blog and I’m very impressed by your resume. My focus is East Africa and as part of my research I see room for substantial improvement in what seems to be a balkanized aid/fair trade advocacy industry. Hope to learn a lot from you. I have accidently come upon your name and work while reading an article on Philanthropy. What I noticed is that we share the last name of Barder. My grandparents came to the U.S. at the beginning of the 20th century from what was then Yugoslavia (Croatia and Slovenia specifically) and the original name was Brdar. The name was “Ellis Island-ized” by the U.S. immigration people as they did to so many foreigners coming in. So I doubt that we are related but thought I would send you a post to see. Your work looks amazing. So glad I came upon it. Hi, i took the Owen pledge but left the title as Ms instead of changing it to Mr. Can you update it for me please, as the site doesn’t allow me to do so myself. I had a superb expertise at Launch Academy.